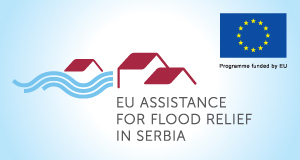 NGO ENECA is currently implementing a project as a co-partner of Danish Refugee Council (DRC) within the program EU assistance for flood relief in Serbia. The program is aimed at assistance to people in municipalities that were most harshly hit by the May floods 2014 in Balkans. DRC is engaged in the reconstruction of 170 individual housing objects and provision of basic household, appliances and furniture sets for the most vulnerable households in the municipalities of Paracin, Ub, Koceljeva, Smederevska Palanka, Velika Plana and Cacak. ENECA, considering previous experience and work orientation, is engaged in reconsolidation of 54 business activities of small and micro enterprises in the same municipalities. Entrepreneurs will be provided with rehabilitation of damaged business facilities, equipped with necessary equipment as well as material, for renewing their businesses. The overall assistance is worth around 1.6 million EUR. The total number of economic grants approved per municipality is 24 in Paracin, 20 in Ub, 4 in Koceljeva, 3 in Smederevska Palanka, 2 in Velika Plana and 1 in Cacak. Until now, tendering procedure for the suppliers of equipment and process material has been done and the suppliers had been chosen. The business facility rehabilitation has been done in the previous period, so now the equipment can be delivered and installed. Currently, the first round of equipment delivery to entrepreneurs is in progress. In this way, the supported entrepreneurs in the flooded areas are very soon going to be able to restore the full scope of their economic activity. The total planned value for this component of the program, assisting entrepreneurs to restart their economic activity, is approximately EUR 351.000. Each activity is being implemented in line with the adopted Implementation Methodology, with specific emphasis on rapid response to the needs, level of vulnerability of affected families, as well as on the impact of the assistance to the respective local communities. The program will be completed in May with all 54 entrepreneurs with renewed business premises and equipped for future, successful work.